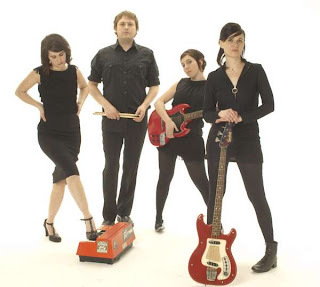 - The Dials at The Empty Bottle - These locals play spunky female-fronted power pop. Also with New York's Mathematicians and The Ettes. More info and tickets. - Headlights at Schubas - Headlights hail from Champaign, and recently released their sophomore LP, "Some Racing, Some Stopping." Also with fellow Chambana band World's First Flying Machine and Chicagoans Helicopters (click for Windy City Rock review). More info and tickets. - Company of Thieves, Skybox and Arthi Meera at Beat Kitchen - Company of Thieves will head up this night of three local bands with an acoustic performance in honor of their new acoustic EP, "Tourniquet." The band plays smooth, melodic rock that shines with the vocals of Genevieve Schatz. The ragtime meets glam quirk of Skybox (click for Windy City Rock review) is also a crowd pleaser, and based on her MySpace tracks Arthi Meera has a beautiful voice. More info and tickets. - The Effigies at Abbey Pub - The Effigies, formed in 1980, are one of Chicago's first punk bands. Also with SSScientists and DJ Morry. More info and tickets. - Band of Annuals at Hideout - Folky alt-country from Salt Lake City. With Chicago's Judson Claiborne. More info and tickets.